Next week, I'm off to Bangkok. It's my third visit to the country, and I discover something new every time. Bangkok is one of my most favorite cities in Asia, and I always want to go back there after each visit. I love that there are so many places to explore in Bangkok, and I love Thailand's rich culture and warm hospitality. For my trip to Bangkok next week, I plan to go to Pattaya because I've never been there. Actually, if I really had a choice I'd want to go to their islands Ko Samui and Phi Phi. However, we only got a three-day trip due to our corporate work schedules (boo!) and we cannot afford to miss a day of shopping. We would have to reserve that itinerary for a next visit to Thailand. I hope I'd get to see their famous elephant show next week. 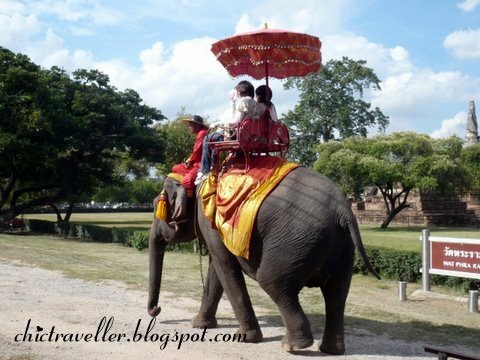 This was taken when we went to the old city of Ayutthaya, but we didn't get the chance to catch an elephant show. I hope I'd get to see the elephants perform in Pattaya. For those who have visited Pattaya before, what are the must-see places there? Wikitravel is always a good resource, but I would love to hear your suggestions too! how nice! enjoy mitzie pie! wow galing. bangkok. love that place. warning lang though sa pattaya...my ofcmates went before and said it's sucky. parang beach ng subic daw and puro mga prostis and white men. if you like less touristy (and sleazy) try hua hin, it's the beach escape of the king. just a suggestion. have fun in thailand. Wow, I also love Bangkok. Pattaya is not Boracay, Bali or Phuket pero you can make most out of it. Even Phuket eh marami rin prostis & white men pero it is still a paradise. Marami naman mga watersports activities dun sa Pattaya at for sure you will have a good time. the Elephant show was awesome you should see it yourself!reli, I was able to watch it last April this year and they... re so cute.. enjoy trip! @kegler747: thanks for the tip! will try to make the most out of pattaya. i'm going to look at other places as well, but it's barely a week to go! It's really for a romantic R&R with hubby and worth every baht! I'd want to visit Bankok as well and will be sure to check out your blog when we do! Hi diplomatic wife. I've always wanted to go to Phuket but I've never gotten the chance. Mark's been there and he visited Koh Samui as well. He said it's a dream. I'll check out your blog for reference when we get a chance to go to Phuket. Keep those posts coming!